"I, Clare, little plant of our Father Francis..."
On Palm Sunday Clare, arrayed in all her finery, attended high Mass at the cathedral, but when the others pressed forward to the altar-rail to receive a branch of palm, she remained in her place as if rapt in a dream. All eyes were upon the young girl as the bishop descended from the sanctuary and placed the palm in her hand. That was the last time the world beheld Clare. On the night of the same day she secretly left her father's house, by St. Francis's advice and, accompanied by her aunt Bianca and another companion, proceeded to the humble chapel of the Porziuncula, where St. Francis and his disciples met her with lights in their hands. Clare then laid aside her rich dress, and St. Francis, having cut off her hair, clothed her in a rough tunic and a thick veil, and in this way the young heroine vowed herself to the service of Jesus Christ. This was March 20, 1212. It’s a dramatic image: the darkness all around them, the fear of discovery and the flight into the unknown…and then, at the end of the journey, the young friars holding lanterns and candles, welcoming her home. Clare wasn’t out of the woods yet. Her father, who’d counted on an excellent marriage for the oldest of his daughters, was furious to find her gone and did everything he could—including using force—to bring her back. Not only did Clare refuse, but she helped her sister Agnes join her as well. That was the beginning, the first community of the Order of Poor Ladies, or of Poor Clares, as this second order of St. Francis came to be called. “This ideal was the exaltation of the beggar's estate into a condition of spiritual liberty, wherein man would live in conscious dependence upon the providence of God and the good will of his fellowmen" (Cuthbert, The Life and Legend of the Lady St. Clare). On behalf of the sisters, St. Clare petitioned Innocent III for the "privilege" of absolute poverty, not merely for the individual members but for the community as a whole. Highly pleased with the unusual request, he granted it, says the saint's biographer, with his own hand. While the rule was undergoing various modifications, the order was rapidly spreading throughout Europe: first in Italy, then in Belgium, France, and Germany. Today they are all over the world, with 16 federations in 70 countries. the habit is a loose-fitting garment of gray frieze; the cord is of linen rope about one-half inch in thickness having four knots representing the four vows; the sandals are of cloth. Clare of Assisi’s dramatic story illustrates the power of God’s call that overcomes all obstacles, transcends all difficulties, and can inspire the world. 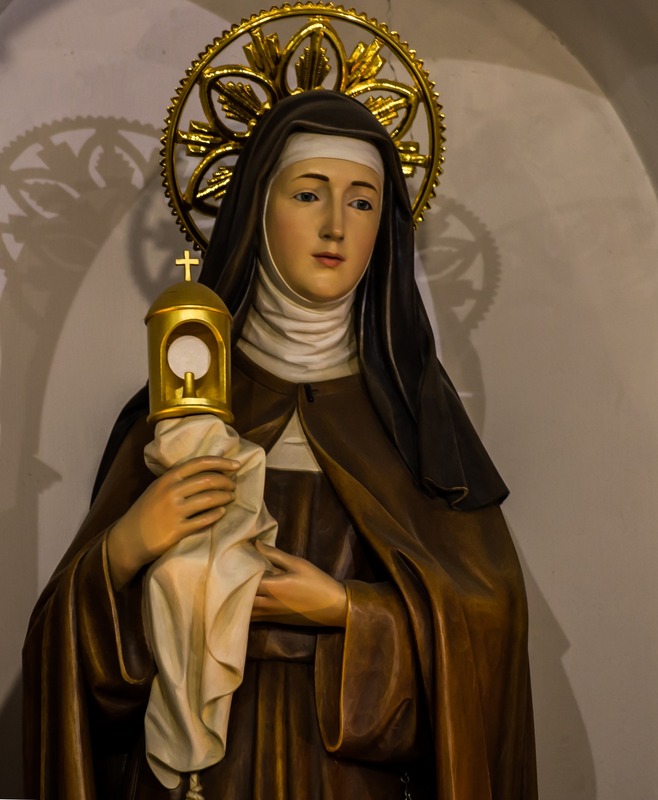 Want to read more about St. Clare's life and vocation? Madeline Nugent's compelling life of St. Clare, Clare and Her Sisters: Lovers of the Poor Christ, is a window into the soul of a woman who lived and breathed Jesus Christ. What makes this book so fascinating is that the author is able to weave extensive historical research and interviews with Franciscan experts into a story that reads like fiction! In these pages you'll be moved by the beauty of St. Clare, as well as inspired by the brave and holy women who followed her in those first foundational years of the Poor Clares.